This article was kindly submitted by Simon Collinson, Content Sales Manager at Kobo. As digital publishers, accessibility is at the core of everything we do. We are the unofficial champions of publishing’s forgotten readers and listeners, the Unicode geeks, the metadata experts. But how many of us could readily pull apart an ebook and tell you exactly where it breached accessibility guidelines? When I first tried DAISY’s Accessibility Checker for EPUB I was overjoyed. After having spent many hours puzzling through obtuse technical specs, I felt I had no better than a patchy knowledge of how to make my books accessible. I knew it was important, but how could I understand the IDPF’s new accessibility guidelines in the context of the complex ebook spec? I had read and reread Accessible EPUB 3, but there was still a nagging sense that I was missing something: that I was letting mistakes through for lack of knowledge. I wanted to make books that would work for every reader, but I had no tools with which to audit my work. Ace by DAISY – the official name for their new accessibility checking tool – solves this problem. It’s a command-line utility which checks EPUB files against WCAG guidelines, W3C accessibility rules, and DAISY-recommended best practices to help you make the best books possible. 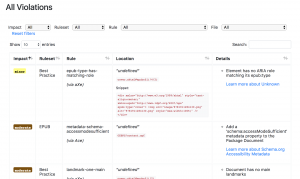 It’s fast, it gives a clean, Bootstrap-based HTML report with severity grades of each accessibility violation, exact locations, and links to learn more about each issue. It runs on the command line, so it can easily be built into existing workflows or used as a package in more ambitious programs. The really important thing about Ace, though, is that it makes accessibility a concrete target with clear steps and a hierarchy of severity. Too often we see #a11y initiatives at publishers fail because although the people making the ebooks understand the virtues of following accessibility best practices, we can’t convey their value to non-technical decision makers, or even if we can, they’re overwhelmed by the sense that accessibility guidelines impose arcane, highly technical – and hence costly – requirements. 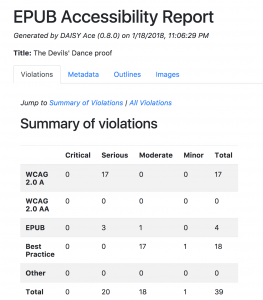 Although Ace ‘does not claim to be a yes/no validator or a certification tool’ and will not issue an accessibility score or percentage of conformance, being able to point to a concrete, objective report is a hugely important step towards demonstrating the value – both financial and moral – of formal, structured accessibility QA. It isn’t the final word on the matter, but it makes the conversation possible. For this reason, DAISY’s efforts should be applauded. 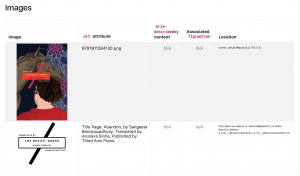 The table breaking down violations into Critical, Serious, Moderate, and Minor breaches of WCAG 2.0 A, WCAG 2.0 AA, EPUB, and best practices is a great quick summary. By the way – for those who haven’t yet taken the leap, please don’t be afraid of the command line. I know I was a few years ago – I’m not a standards geek or one of our community’s truly gifted programmers, just an average ebook dev with average skills. But I’ve come to love the precision and speed of all the open source tools like Ace. If you’re comfortable cracking open an epub and deciphering its contents then you’re more than capable of tackling the much simpler process of installing and using a few friendly command line tools. I promise. Click here for step-by-step instructions on installing Ace. Without Ace I would have almost certainly have forgotten to update this title page caption. So what are you waiting for? Give it a whirl. Simon Collinson is Content Sales Manager at Kobo and Digital Producer at Tilted Axis Press. An Australian web developer, typesetter, and digital publishing specialist, he now lives in Toronto.